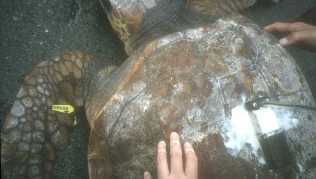 In order to consider ways of protecting turtles, it is essential to know their geographic range. We have attached tags to turtles caught accidentally in fishing nets and nesting turtles to investigate the range of turtle activity. Want to know more about tagging?